Calling all design fans: The Domino holiday pop-up shop is back, and this time, it’s bigger than ever. This year, we’ve partnered up with Amazon Home to curate the ultimate gifts of the season. Featuring an array of inspired pieces, you’ll have the opportunity to shop items handpicked by Domino editors, leading interior designers, and creatives. Situated in the heart of SoHo, New York, the brick-and-mortar store is filled with an array of immersive experiences. Shoppers will be able to scan and purchase products using the Amazon App, which will then be delivered to their doorstep. Yes, it doesn’t get easier than that. The Kid Zone boasts a drawable Formica surface, which will allow little ones to unleash their creative side while you browse for gifts. 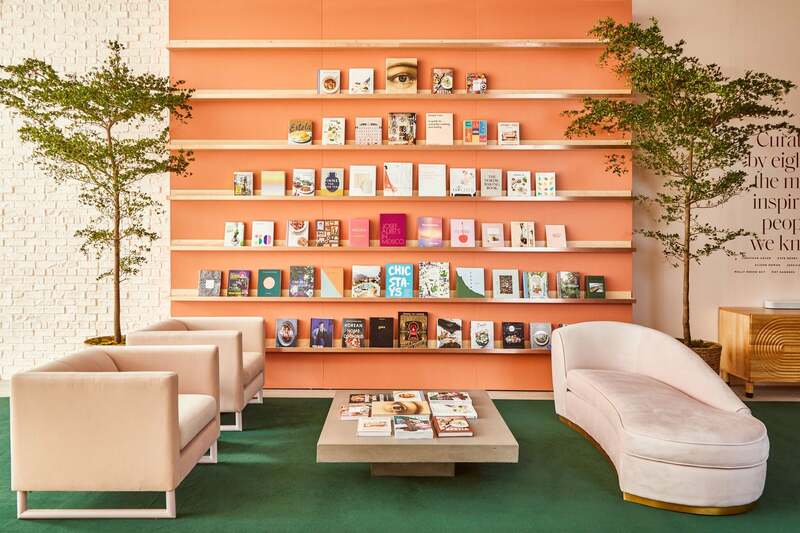 Then, take a break from shopping and relax on the Tuft & Needle daybed or head to the back of the shop, where you’ll find an Instagrammable moment featuring a customizable color background that’s voice-activated by Alexa. Last but not least, explore our impressive edit of the best that Amazon Home has to offer and find a little something for everyone on your list. Because there’s no better way to get in the holiday spirit than by showering your loved ones with the thoughtful gifts they deserve. The Domino x Amazon Home Holiday Home is located on 446 Broadway, New York, and will be open from December 1 to December 24. An ultra-contemporary and colorful revamp transforms this culinary staple into a decorative accent in its own right. As far as we’re concerned, this is the only proper vessel we’ll be consuming our bubbly in this NYE. This spirited rendition of a bar cart staple seamlessly merges form with function. We’re swooning over the palette of this multifunctional set, which can be used to organize everything from sauces and snacks to desktop trinkets and more. A cocktail shaker that’s durable enough for use by the campfire—as well as one that can satisfy your biggest dinner party—is a no-brainer. This coffee table essential will add a bold splash of color and a serious dose of wanderlust to boot. Ditch your ordinary wooden fruit bowl for this Scandi-chic vessel to give a basic arrangement a touch of modern style. Pair this beautifully detailed planter with your go-to green for a foolproof hostess gift. Cacao and honey combine in this ingenious blend that’s sure to become a staple in all your culinary endeavors. Give your stovetop the pop of luster it deserves, courtesy of this elevated saucepan. Can’t make it out to the city? You can shop all the gift guides here.